This week we continue our exploration of the manner in which Jesus defines himself, helping us to better understand the importance of his example, to better respond to the Creator’s call, and to better practice the Spirit’s New Law of Love. Today we share this reflection adapted from a Favorite written on April 24, 2007. These words are so well known. They are so beautiful and complete. They embody the paradox that is our life. All fades away except for the one vibrating and constantly resonating truth. Love. There is nothing else. It is a gift freely given to us by the Creator, Incarnate in the Son of Man, and ever present in the In-Dwelling of the Spirit. All we need do is return the love. Because God alone is enough. We constantly look for presence and miracles; yet we too often ignore The Way that lies before us. Yesterday we remembered the guidance we receive from Jesus, The Good Shepherd. Today we step boldly onto Christ’s Way. God says: I understand that The Way I lay before you is full of pitfalls and stumbling blocks. Today I ask you to remember that every obstacle that obstructs your path is a stepping-stone for you to use as you grow and live in me. I ask you to remember that every gaping hole that suddenly appears to gobble up The Way, is an opportunity for you to rely on me. I will guide and protect. I will lead and heal. I will restore and transform. I am The Way, and I send my son to you to live in that Way with you. When we consider Paul’s description of Jesus’ Law of Love, we open our hearts to possibility. Tomorrow, Jesus says, “I am The Way”. Moving forward in this fourth week of Lent, we explore the demands the Gospel places on us. Perhaps one of the most difficult challenges is the call to share all that we have hoarded with those who have little. God says: If you fear your wealth separates your heart from mine, then bring that fear to me. If you worry that your good fortune is a sign that you are distant from me, bring that worry as well. Share what you have with prudence. Give what you can without looking for a reward. Answer the call you hear deep within. When you listen with care, you know that I am the one who has graced you with talents to gather the harvest that fills you. Be generous with this gift of my bounty. Remember that nothing destroys the treasure of a generous heart while the treasures of your world quickly fade into nothing. Click on this image for a video commentary. Today’s Favorite returns once more to 2 Maccabees, the first Book cited in the first Noontime Scripture reflection. The message is as simple, constant, and powerful today as it was more than a decade ago. Be steadfast. Trust in God. Remain faithful to God. Life is a struggle, but God is with us. We need not be afraid. Today’s citation reminds us of a strong underpinning of those themes: there is life after our apparent death, and we must pray not only for ourselves but for those who have strayed from the covenant as well. 1 Maccabees 5:6 gives a different reason for the fall of the Israelite troops – the priests had wanted to distinguish themselves in battle – but the message is the same: if we succeed in remaining faithful to our covenant with God, we must pray for those who fallen. We will not want to miss the true life that follows this one, and we will want to share this full and generous life with our families and friends. And lest we fear that our loved ones will not accompany us, we remember that it is possible to bring straying sheep into the fold through petition to the Creator. We remember that with God all things are possible. Christ is the one who offers himself in expiation for the downfall of the world and thus becomes the Redeemer of all. We participate in this redemption by offering our own sufferings in expiation for others. The dead will live again, and this we can believe. Over time, we have spent several Noontimes reflecting on the lessons brought to us by the Maccabeus family. Their stamina, their perseverance, their refusal to be extinguished, and their refusal to allow God’s law of forgiveness, mercy and justice to be extinguished is seen again in all of Christ’s followers. Jesus’ disciples are constant searchers of God’s essence and truth. They will always hunger and thirst for an essence they feel but cannot see, a Spirit they know but cannot always touch. The Maccabeus family tells us this story. Jesus the Redeemer invites all of us to be these followers. It is the endurance of the Maccabees we seek through our intense hope in the promises of God. It is the fidelity of the Maccabees we seek through our deep faith in the goodness of God. It is the devotion of the Maccabees we seek through our passionate love for the ways of God. Tomorrow, a prayer for trials and obstacles. Adapted from a Favorite written on April 25, 2009. We have learned from the story of Job that God interacts with us when we argue as easily as when we petition or praise. 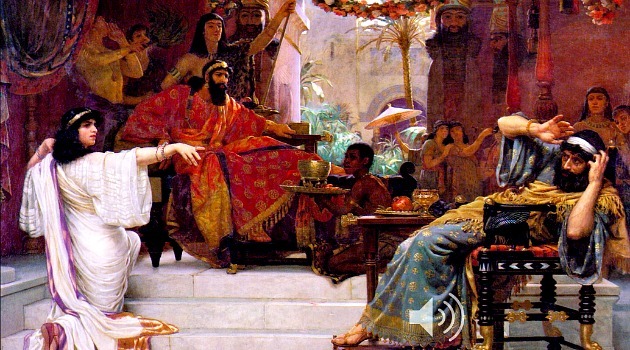 As we near the feast of Purim, we consider the story of Esther. Notes and commentaries will help us unravel the confusion of the chapters in this book, and it will be a worthwhile task – for this story is one of the most uplifting in the Old Testament. It reminds us of the fear all humans feel when they see a task looming before them which causes them to faint away. It also reminds us of the surprising gentleness we will find in the heart of an awesome, fear-inspiring king. And it finally reminds us of the courage we receive as grace when we place ourselves in the hands of this king. Life is difficult. It is threatening, it is sometimes over-powering. Where do we go when we feel panic, anxiety, abandonment, a sense of uselessness or futility? Like Esther, we discard our penitential garments and don our vestments of royal attire. As adopted sisters and brothers of Christ, we take ourselves before our king, we lay our life in his hands, and we petition, even though we may faint away from the effort. Spending time with this story we remember and reflect on some of its essential elements: we must respond when we are called (4:14), God saves us from the power of the wicked (C:29), those who plot our downfall end by suffering the punishment they would have inflicted on the faithful (6:8-11), hopeless situations can be reversed because with God all things are possible (9:1). To these prayers let us add our own . . . Amen! Senior, Donald, ed. THE CATHOLIC STUDY BIBLE. New York, Oxford University Press, 1990.536-537. Print. Written on July 16, 2008. A Favorite from November 11, 2009. My daughter and I are praying for a common cause these past few days and I just found this morning that we each picked up a Bible and turned to the same verse. It spoke to each of us about the cause we hold between us. We are praying for someone who “lords it over” others and on the same day at nearly the same hour we stumble upon the same verse. We are all more connected in more ways than we know and understand. We ought to try to be more aware of this . . . especially regarding those whom we perceive to be enemies. We need to pray more for them, and we need to pray more for all of us. Jesus tells us (John 15) that he is the vine and we are the branches, and he reminds us that we can do nothing in and of ourselves; we must rely totally on God. He also tells us that we are so loved that we will be pruned and tended so that we will bear fruit to nourish the world. This pruning will be painful but it is essential for our own transformation . . . and for the transformation of the world. It is in our willingness to sacrifice ourselves for the good of others that we find our best selves, our true potential. It is in this self-giving that we reach out and embrace Christ and the work he has in mind for us. It is through this work – completed in love with the one who knows all suffering and all pain – it is through the Narrow Way and through This One that we find our own divinity. Hear, therefore . . . hearken! Authority for this divine work comes from Christ himself. God alone decides. We cannot presume to understand the complexity of God’s plan; nor ought we decide what tasks are ours to take up or to put down. The Lord shows no partiality nor does the Lord fear greatness. When we allow our fear and anxiety to get in the way of our own conversion, we behave as though God cannot handle the difficulties in our path; yet we know that God is capable of all. With God, all things are possible. For the first step toward discipline is a very earnest desire for Wisdom. We find strength to do what we must do when we sink into the comfort offered by the Holy Spirit. With patience, with silence, and with waiting . . . Wisdom arrives to accompany her handmaidens whom she sends out into the world. Hear, therefore . . . and hearken! And let us pray . . .
We share these reflections from Holy Week of 2007 while I am away from electronics. Keeping all of you in prayer each day at noon. Once we trust God, and once we make a faithful and honest Examination of Self, we enter into intimacy with God. This special relationship brings with it a new understanding of how and why we are grateful after a time of affliction. This new relationship that comes to us after great tribulation, and after a new understanding of our human frailty, is God’s celebration of new life and a new creation in us. Paul’s description of the valleys and mountains in his relationship with the people of Corinth is a mirror of his – and our – relationship with God. We can rely on Jesus to shepherd us, and the Spirit to heal us. When we use the scripture link and commentary to explore this letter, we realize that none of us is perfect; and we discover that with each crisis and the ensuing aftermath, we arrive at a newness we had not thought possible. We also discover anew that with God, all that appears to be impossible is, in reality, possible. A Favorite from October 6, 2007. To read the epilogue (Esther F), consult the New American Bible (NABRE) using the scripture link above. We must remember that God is always loyal to the covenant promise, and we need not expect anything less than perfection from God because with God all things are possible. As Mordecai says in today’s reading when he realizes that the outrageous hope of which he dreamt has actually been fulfilled, This is the work of God. Mordecai recognizes God’s effort to convert harm to good. He sees that not a single detail has been left unfulfilled. He recognizes the meaning of the symbols of the spring, the light, and the dragons which had previously been unclear to him. He sees what God has arranged, and what man has plotted. He recognizes that God has saved his people and delivered us from all these evils. He now understands that God worked signs and great wonders which we were too frightened to see and appreciate as we ran the gauntlet of obstacles laid out by ourselves and others in anticipation of our fall. Mordecai now feels the full impact of his rescue and reparation. He has let the reality of the outcome of his innocent suffering come into focus. He now sees fully that the horrific end which his enemies had plotted is not his and Esther’s – for it is not the Jewish people who hang from the gallows but instead, those who ordered the gallows built. Not only has God saved, God has at the same time turned evil into good, passed judgment and handed out consequences.